As a kid, I liked this book a lot and much better than our last installment. This book features Spider-Man, back in his classic costume, fighting the Latin American assassin La Tarantula, who works with the Captain America to capture Spider-Man. Spectacular Spider-Man #138 “Night of the Fog"
The book kicks off with an interesting scene of Captain America holding Spider-Man so the Tarantula can spike him. It turns out the whole scene is an elaborate revenge fantasy on the part of La Tarantula, a South American villain that combines Zorro and the Iron Sheik. Tarantula was day dreaming during a briefing. We've hit full wrestling territory this issue, foreign heel with a spiked shoe and a heel turn from Captain America! He enlists the help of the US State Department and the Commission on Superhuman Affairs to hunt down Spider-Man, who is accused of protecting an enemy of his government, Elvira Corona. She attacked Tarantula last issue and Spider-Man intervened. This new Captain America has to learn that guys with flattops like that are never the good guys. Corona is now awaiting deportation. Peter and Mary Jane begin trying to help her apply for amnesty but Corona does not qualify. Can someone tell me whats going on with MJ's mouth in the panel to the right? There’s an interlude with Joe Robertson and Tombstone foreshadowing the events covered in the previous installments, "As the Spider's Web Turns" and "What Do You Want on Your Tombstone?" “Cap” and Tarantula question Elvira, after knocking out the guard to her cellblock. As someone who works security, this is my worst nightmare. The interrogation consists of Tarantula threatening her in Spanish while “Cap” looks on like a clueless gringo, wondering what the original Captain America would do in his place. He also notices the way that all of the detainees look at the flag he wears with fear. Eventually, she gives up the name Mary Jane Parker as her contact to Spider-Man. It's amazing that he's taken seriously with that mustache. They call MJ and set up a meeting with Spider-Man, luring him to a train yard. 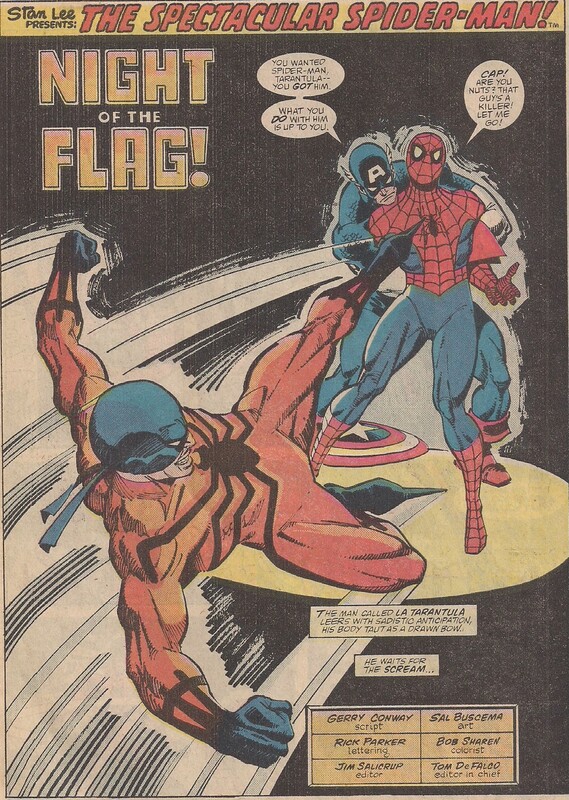 Tarantula gets the upper hand early, as Spider-Man’s spider-sense goes off, he spins around and let’s his guard down when he sees Captain America and gets a shield to the face for his mistake. He hit him so hard that he knocked him clear off the page! The battle ensues with “Cap” growing uneasy with his alley, who begins to let it out that he’s really out for revenge against Spider-Man and the webslinger is no terrorist. Eventually Captain America walks off leaving his partner as Spider-Man gets the upper-hand. My one regret is that during my time at Marvel, is that I didn't get one of these caricatures. The immigration crisis is giving Peter nightmares. Yes, while this issue serves as a super-hero vs super-hero battle that fans love, it also touches on some interesting social issues that are still relevant today. Captain America agrees to work along with the less than angelic Tarantula in order to aid in the battle against communism, a very topical issue to bring up not long after the Iran-Contra scandal and during the tail-end of the Cold War. Captain America is also unsure, who is the terrorist and who is the freedom fighter. The refugees being detained after fleeing their country and fearing the US is relevant today, as we have candidates running for President on platforms of walling off our borders keeping out immigrants from Latin America and banning refugees of certain backgrounds all together. It’s interesting to see Peter and Mary Jane looking into Amnesty for an undocumented alien in the 1980’s, not a system you would expect to be in place in the 1980’s and something we still debate today. If you come across this book, pick it up. It’s a fun read, and hits on some interesting and topical issues. We head to Cosmic Corner of the Marvel Universe to witness Reed and Sue Richards battle over the powerful Soul Gems! Can the Silver Surfer stop them before they kill each other? Find out as we check out Silver Surfer# 16 See you next week! Same as last week. Apparently, TSR blew its whole advertising budget on Marvel books.